From left: Sydney Swans youngsters Tom McCartin, George Hewett and Oliver Florent show their appreciation for the red and white faithful. Although the moment Donna McGrath told her husband David “I do” wasn’t the moment she struck a love for the red and white, that precious moment at the altar 46 years ago sewed the seed for the through-and-through Sydney Swans passion now coursing through her veins. Donna hardly had an interest in the red and white when she married lifelong South Melbourne supporter David in 1972, but the Melbournian now records every Swans game she attends so – win, lose or draw – she can jump back on the rollercoaster as soon as she’s home. The full-blooded Swans member also decks out her home in red and white for the biggest games on the fixture, and she even jokes she’s “thoroughly disgusted” her three children follow Hawthorn, Essendon and Melbourne. “David used to play football, my brothers played football and now our son plays football, so I always liked the general football side of things. It was all a flow-on from David and then we started going to games together,” Donna told Swans Media. “It was probably from the time that South Melbourne moved to Sydney that I really started to love it. We started going up with our neighbours when Sydney played Melbourne and have a weekend away, and we go to as many Swans games in Melbourne as possible. While the Swans had captured Donna’s heart by the early 1980s, it wasn’t until the late 1990s she began to consistently head to games – and she knows exactly why. Former Sydney skipper Paul Kelly was at the height of his powers and Donna adored the man idolised as ‘Captain Courageous’. In a 12-year career spanning 234 games, Kelly captained the Swans between 1993 and 2002, claimed the 1995 Brownlow Medal, earned four Club Champion honours and was a three-time All Australian. He was also inducted into the Australian Football Hall of Fame in 2007, became a Bloods Legend of the Swans Hall of Fame in 2009 and is vice-captain of the Swans Team of the Century. Donna said there was a lot to admire in Kelly. “He was just a ‘doer’,” Donna said. “He would get in there, he would play hard, he was a great leader, he was a great captain – ‘Captain Courageous’, they called him. 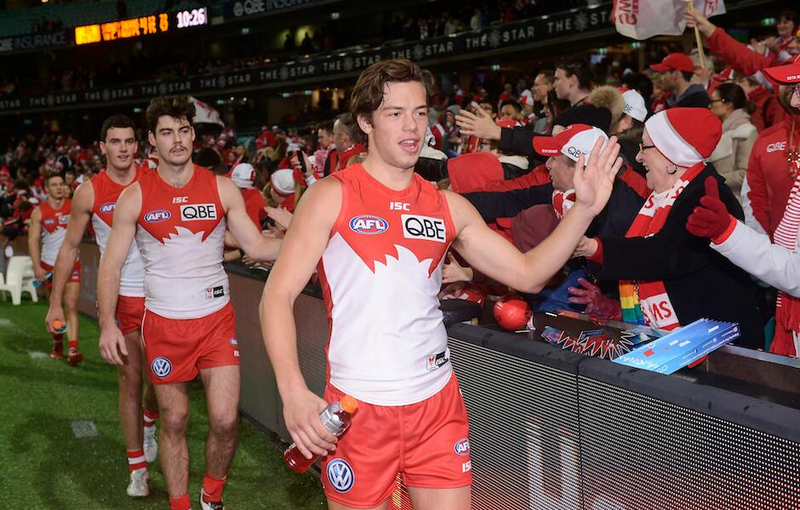 Donna’s favourite Swans player of today is star defender Dane Rampe, who will lead Sydney as a co-captain alongside Josh Kennedy and Luke Parker in season 2019. Sydney will get its campaign underway in a clash with the Western Bulldogs at Melbourne’s Marvel Stadium on Saturday night, and Donna had a message from the heart for her beloved Swans ahead of the season-opener. “I wish the team all the very best for the season, and onwards and upwards and onwards to victory,” Donna said.